FEATURE: A blind Romanian handball fan can relive great moments with the national team thanks to a special 3D poster of his favourite star – Cristina Neagu. The game of handball has always had a reputation of one of the most accessible sports in the world. But the recent touching story from Romania has proved that handball can beat all limits and even disabled fans can enjoy the same passion and excitement as their colleagues in the stands. At the beginning there was just an idea of another fan. One of the most loyal supporters of Romanian handball, Angela Ciuciulin Pop, suggested to attract disabled and blind people to the matches of Romanian national team. Before long her call was responded by the Romanian handball federation together with several sponsors and partners involved in Romanian handball (Asociatia Derzelas, BRD Societe Generale, the creative agency Leo Burnett Romania, PR agency Sports Net Management). “These blind people never saw a handball game, never saw or touched the players but still come to our games. They live the games through the audience’s reactions, through the fans chants of joy or sighs of sadness,” said Lorand Balint, one of the project's responsible. In March 2015, after Romania defeated the reigning world champions Brazil in a friendly at home, Silviu, one young blind Romanian fan, was happily queuing for more than one hour to take a photo with, and get an autograph from his favourite player, Cristina Neagu. “While he was waiting together with the rest of the fans for the team to come out from the locker rooms, we realised that he is doing all this effort for something that he will actually never see – he will treasure it, nurture it without knowing exactly what it is. “But the reality is that blind people have their own, special way of looking at things, that they can see many things through their fingers – building on the touch sense. Then why not create something that Silviu could actually see?” Balint added. They decided to move fast and for the next games of the Romanian team they prepared a special set for disabled people - fan T-Shirts with messages written in Braille alphabet and special pens that make any writing thick with a sort of 3D effect. 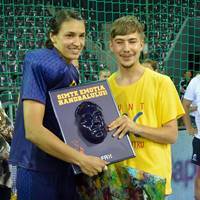 In addition they produced a special relief of Cristina Neagu's face – a gift to Silviu. Cristina’s head was scanned and, using a special 3D printing technology, the first ever poster of a sport star of this kind has been created. The gift was presented to Silviu by the co-reigning Women's EHF Champions League top scorer (together with Andrea Penezic) herself. “I think these people deserve our full support. It is really amazing that they go through all this effort to come to the matches. They really want to feel the pure emotion, the adrenaline that only handball can produce,” Neagu commented for ehfcl.com. “I am very happy that I could help them achieve this and feel what handball is all about. After the game against Serbia, they were excited, but I felt that they were very anxious. Hats off for them and I would do everything for them at any given moment. They are living proof that you can achieve everything, even if you have some problems,” the 2010 World Handball Player of the Year added. Even after several months Silviu still talks about the encounter with the Buducnost star with a lot of excitement. “Cristina Neagu is the best handball player in the world and she makes us so proud of being Romanians. It was such an honour to hug her, to feel her," he said. "I live each and every handball game with all my hearing and soul. My blindness made me imagine all the time what¹s happening on the pitch based on the general atmosphere, the supporters' reactions and the comments coming from around. Handball means so much to me. It's such a gentle sport with so many goals. “I follow handball also on TV, but nothing compares with the feeling I have when I am in the middle of it, in the arena,” Silviu explained. In 2015, the Romanian national women's team played three games at home, in the Cluj Arena – all of them sold out events with more than 7,300 people in the audience. For the first game we had less than 20 people with disabilities. The number grew to 30 and than to more than 80 – including 21 blind people.